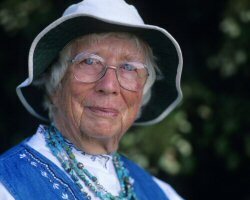 Our founder, legendary horticulturist, Polly Hill, who died April 25, 2007 at the age of 100, was a practical gardener who learned from trial and error. At the age of 50 with patience and determination she decided to grow an arboretum by sowing a seed. Known as a realist, she never thought it was all that remarkable; but her extraordinary life and indomitable spirit were remarkable and an inspiration to all who knew her. In 1926 Polly’s parents purchased the property, called Barnard’s Inn Farm, converting the old sheep farm into a family vacation home where Polly spent many carefree summers. In 1932 she married Julian Hill and began a family in Delaware. After the death of her parents she and Julian took over management of the farm. Polly found the Vineyard “horticulturally impoverished” and was determined to learn what else she could grow. She began planting seeds. In 1958, Polly planted her first seeds and prepared a small nursery bed. As the years passed an arboretum gradually emerged from simple elements. Additionally, as seeds arrived from across the North Temperate Zone, Polly experimented with and successfully grew numerous plants that no one would have predicted could grow under the climatic conditions of Martha’s Vineyard. Along the way, Polly also selected superior forms of the plants she grew and gave them cultivar names- many associated with family members – and made them available to the horticultural trade. As a consequence of her generosity and the outstanding nature of her selections, Polly Hill introductions are now cultivated in gardens around the globe! Polly’s optimism, intelligent curiosity, and perseverance paved the way for her success. She became known in the horticulture world for her experimental approach and her recordkeeping that detailed every seed she grew. Polly received at least 13 awards for her achievements, but despite these accolades she was happiest growing plants and sharing her arboretum. Polly wasn’t just an inspiration to gardeners; she motivated anyone seeking the determination to change their life at any age. Polly always said, “Fifty is a great age to try something new.” Now fifty years later her “experiment” has become the Polly Hill Arboretum, and she, until 100 years of age, remained interested and active in the Arboretum’s plans. That’s inspirational by anyone’s measure. The Polly Hill Arboretum is Polly’s living legacy. It could be simply described as a museum of trees set within a landscape of open meadows, woodlands, and stone walls, but it is much more. It is a vital public garden, a scientific institution, a community resource, a historic landscape, a conservation corridor, and a beloved Island landmark. At PHA it is our mission to perpetuate Polly’s experimental tradition by sharing knowledge of plants through education, research, plant conservation, and exploration. Polly’s legacy will continue to nourish the Arboretum she began by planting a seed.